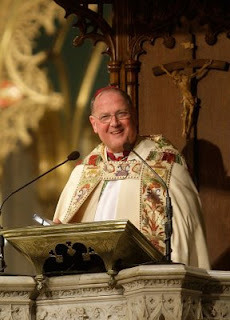 The nation's de facto primatial see (actually the US has no such thing, and Baltimore has prerogative based on its being first) has a new occupant as of this afternoon --and huzzah! Here's a 20 minute press conference from this morning. The guy's awesome...and look how the press is eating out of his hand. Fantastic photos and coverage here. Terrific homily, too. You'll want to RTWT. I mentioned to you that the Church continues not just the rising but also the dying of Jesus Christ. We’ve just been through a litany of ways that the rising of Jesus radiates in the Church in this historic archdiocese. But we’d be naive if we overlooked the dying, wouldn’t we? I say to you, my sister and brother disciples now on the road to Emmaus, let’s not turn inward to ourselves, our worries, our burdens, our fears; but turn rather to Him, the way, the truth, and the life, the one who told us over and over, “Be not afraid!”, who assured us that He “would be with us all days, even to the end of the world,” and who promised us that “not even the gates of hell would prevail,” the one who John Paul the Great called, “the answer to the question posed by every human life,” and recognize Him again in His word, in the “breaking of the bread,” in His Church. Let Him “turn us around” as He did those two disciples, turned them around because, simply put, they were going the wrong way, and sent them running back to Jerusalem, where Peter was, where the apostles were, where the Church was.